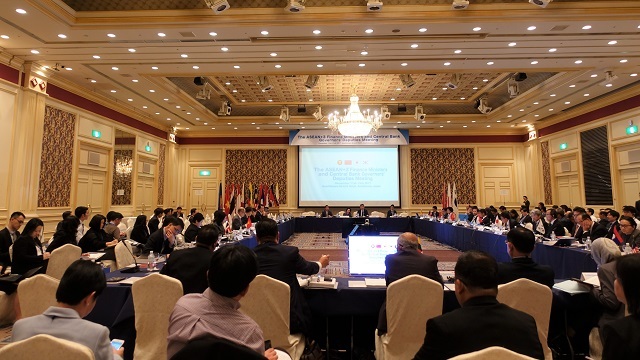 ASEAN+3 Finance and Central Bank Deputies, academics, and high-level representatives of international financial institutions discuss challenges and issues relevant to the regional economic and financial cooperation at the 2017 ASEAN+3 Financial Forum hosted by AMRO on December 11, 2017, in Asahikawa, Japan. 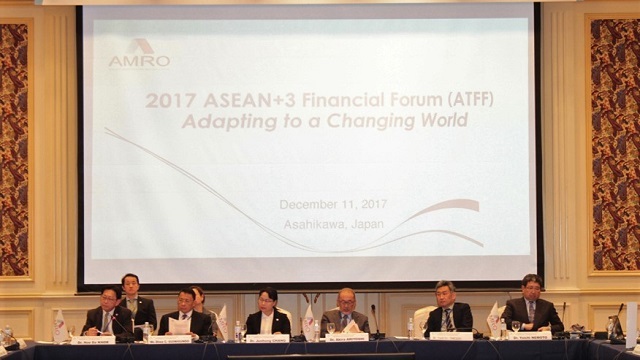 ASAHIKAWA, JAPAN, December 11, 2017 – Today, the ASEAN+3 Financial Forum (ATFF) 2017 with the theme “Adapting to a Changing World” was held back to back with the ASEAN+3 Finance and Central Bank Deputies’ Meeting in Asahikawa, Japan. Hosted by the ASEAN+3 Macroeconomic Research Office (AMRO), the half-day program focused on the regional outlook and policy responses to address structural challenges, and developments in the international monetary system and the role of the Chiang Mai Initiative Multilateralisation (CMIM). As the Co-chairs of AMRO Executive Committee for 2017, Mr Diwa C. Guinigundo, Deputy Governor, Monetary Stability Sector, Bangko Sentral ng Pilipinas, and Mr Yoshiki Takeuchi, Director General of the International Bureau, Ministry of Finance, Japan, delivered keynote addresses at the forum. Discussants and speakers included high-level policy makers, renowned academics and economists who have strong background and experience on the East Asia region. In the first session moderated by AMRO Chief Economist Dr Hoe Ee Khor, panelists discussed how economies in the region should deal with the rising sentiments of anti-globalization and protectionism, and emerging structural challenges of aging populations and new technologies. The panelists noted that the conventional export-led growth strategy has enabled many Asian countries to move up the income ladder rapidly. This strategy allows a developing economy to take advantage of its abundant labor to attract foreign direct investment (FDI) to produce goods for exports to global markets, and absorb technology transfers. However, slow growth in global trade following the Global Financial Crisis and the threat of protectionism have raised concerns about solely relying on an export-led growth strategy, and provided impetus for diversification of export markets and rebalancing to domestic demand. Underlying the backlash against globalization are also new technologies of robotics, automation, digitization, and internet of things, which have raised concerns about implications for growth and job creation in both developed and developing countries. To address these challenges, the panelists highlighted that ASEAN+3 members would need to implement and follow through on structural reforms to set their economies on a solid foundation for continued robust growth. Enhanced economic and financial cooperation among the regional economies would make the best of each economy’s comparative advantage while safeguarding regional financial stability. 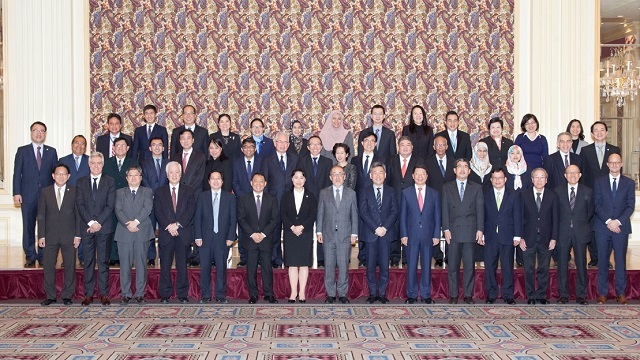 AMRO Senior Management team, ASEAN+3 Finance and Central Bank Deputies, and distinguished speakers and participants at the 2017 ATFF. Moderated by Dr Yoichi Nemoto, former AMRO Director, the second session focused on developments in the international monetary system and the evolving global financial environment. The CMIM was established in response to the Asian Financial Crisis when countries in the region were badly affected by highly volatile capital flows. The facility was multilateralized and enhanced in the wake of the Global Financial Crisis (GFC) in recognition of the vulnerability of member economies to USD liquidity shocks. Against this backdrop, panelists discussed how the CMIM could be further developed to complement the existing layers of the GFSN, taking into account lessons learned from the GFC and European Sovereign Debt Crisis as well as recent reforms by the International Monetary Fund to its lending facilities. The discussion also focused on how to strengthen the CMIM’s role in the region to meet the challenges ahead. Possible enhancements to the CMIM through liquidity assistance in local currencies were also discussed. An important initiative of AMRO, the ATFF acts as a flagship platform for ASEAN+3 Deputies, academics and high-level representatives of international financial institutions to brainstorm on challenges and issues relevant to the regional economic and financial cooperation. The ASEAN+3 Macroeconomic Research Office (AMRO) was established to contribute to securing the economic and financial stability of the ASEAN+3 region, which includes 10 ASEAN countries and China (including Hong Kong), Japan, and Korea. AMRO fulfils its mandate by conducting macroeconomic surveillance, supporting the implementation of the regional financial arrangements, the Chiang Mai Initiative Multilateralisation (CMIM), and providing technical assistance to the members.